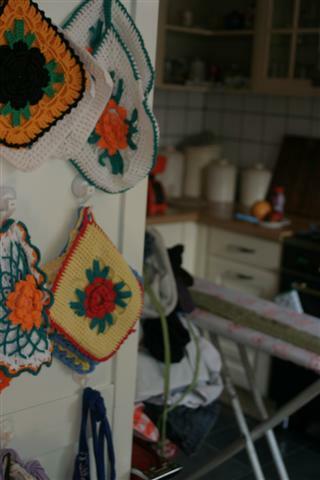 I keep finding these crocheted potholders in thriftshops and I’m fascinated by them. Such an intricate pattern, with those 3D rose petals. When I’m feeling really brave I think I will try to copy it. But for now I’m just smiling every time I see them hanging on the side of the kitchencupboard. In the background you can see my ironing board with my branching out scarf blocking on it. I finished that in only four days! After all the blankets that really feels great. Even further in the background (but I doubt you can really see it) is my lunch. A smoothie, an apple and a grapefruit. I have the very bad habit to eat too much when I’m feeling sick and I have done that the past two days. I even ate a lot of sugar while I usually do without. I have been having trouble to eat healthy for months now (I have been fighting colds all winter), but it’s getting worse. So I decided I needed a big change. And since I’m already dizzy and feeling weak, and since I have already declared this a week of hanging on the couch and resting, I thought this was the best time to try to detox a bit. So no sugars, no cheese, no bread for me for a while. 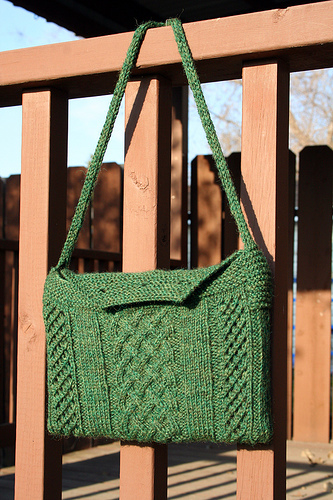 I’m going to try this pattern now. Looks interesting and not too big a project. I want to make hats, berets, socks and sweaters, but most patterns ask for needles I don’t have. I have only one size dpn’s and only very thick circular needles, so for now I have to go projects that call for straight needles. Not a problem, there is so much to choose from on the internet, that I could knit all my life and still not finish everything. I just realized today that this is one of the main reasons I’m having so much more fun crafting now than fifteen years ago when my kids were little. Back then I missed the interactive part: showing finished objects on Craftster, blogging about it, getting feedback and inspiration from other craftsters. I think that is one of the great things about the internet.